NAGASAKI (Kyodo) Researchers have discovered what they believe to be Japan's oldest depiction of whaling, on an urn dating from around 100 B.C., according to officials with the Nagasaki Board of Education. The urn, made during the Yayoi Period (about 400 B.C. to 300), was unearthed in 1974 from the Harunotsuji ruins in Nagasaki Prefecture. Only in January did researchers notice that it bears a whaling scene. 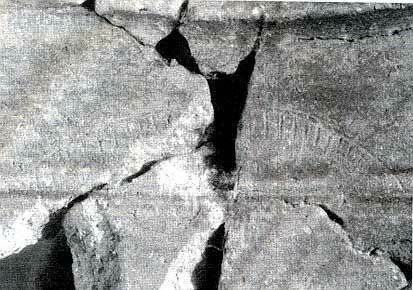 The drawing is estimated to be far older than the sixth- or seventh-century whaling wall-paintings in a stone room in the Nagato-Onizuka burial mound in Konagai in the prefecture, currently considered the oldest paintings of whaling in Japan. A depiction of a whale measuring 5.6 cm long and 4.5 cm wide adorns the upper part of the vessel, along with an illustration of an inverted ship measuring 9.2 cm long, they said. Researchers believe the drawing represents whaling because of the size of what seems to be the whale compared with the ship and several sticks believed to be harpoons that are stuck in the whale. "This is a valuable discovery that shows (humans) boarded a ship and whaled aggressively by using harpoons," said Makoto Sahara, head of the National Museum of Japanese History. Masayuki Komoto, an archaeology professor at Kumamoto University, said that it makes sense locals depicted whaling because waters near the ruins are part of an area that is a known whale migration route. The urn is about 61 cm high with a mouth 36 cm in diameter, according to the officials. It is a funerary vessel that was commonly used in northern Kyushu during the Yayoi Period. In January, researchers found another vessel from the ruin bearing the image of a dragon. The discovery of the dragon led researchers to inspect earthenware that had been unearthed in previous excavation projects, according to the officials. The board of education believes the urn was used in the burial ceremony of a child who was of relatively high social rank, due to its small size and red paint found on it, they said. However, Hiroyuki Hashimoto, an archaeologist in Nara Prefecture, voiced doubts about the discovery. "I cannot comment on the drawing because it is too abstract," he said. "But there is a possibility that the drawing may represent whaling, taking into account that whaling was traditionally popular in (what is now) Saga and Nagasaki prefectures."